Join Ratty, Mole, Badger, Otter, Portly and the "famous" Mr Toad as they return to the Royal Botanic Gardens in Melbourne this Summer, in Kenneth Grahame's immortal story of life on the riverbank. Set at the start of a glorious Spring season, this timeless classic begins with an unlikely, lifelong friendship when Mole meets Ratty one day. 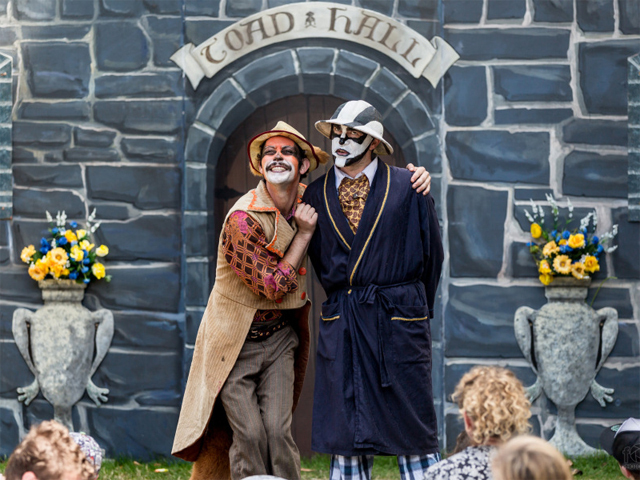 Through Ratty, Mole meets Badger, Otter, Portly and Toad, and the motley group end up on wonderful and wild adventures - battling foes, supporting each other, and learning about the importance of friendship. A Melbourne institution, the Australian Shakespeare Company's season of The Wind in the Willows has now been seen by generations of Australians. First playing in the Royal Botanic Gardens in 1987, this critically acclaimed outdoor theatre production delivers music, songs, and laughs. There's fun for young and old as the Head Chief Rabbit transforms the audience into rabbits with a waggle of the ears and a wiggle of the nose. Children are encouraged to get involved in the action and given every opportunity to sing along and become part of the adventure. With laughs and surprises for children and adults alike, this is interactive theatre at its best. The Wind in the Willows is Australia's best-loved affordable family entertainment. Bring the kids, family and friends, pack a picnic and join in the fun!